BIOSTAR unveils RACING X470GT8, a full ATX motherboard with the AMD X470 chipset for the second generation AMD Ryzen processors, Pinnacle Ridge and Raven Ridge. The BIOSTAR RACING X470GT8 offers performance and aesthetics for today’s overclockers and gamers. It has a premium black RACING themed PCB design, Digital Power+, Hi-Fi zone design, integrated USB 3.1 Gen 2 (Type A + C), Iron Slot Protection, and Advanced VIVID LED DJ for more RGB lighting control. 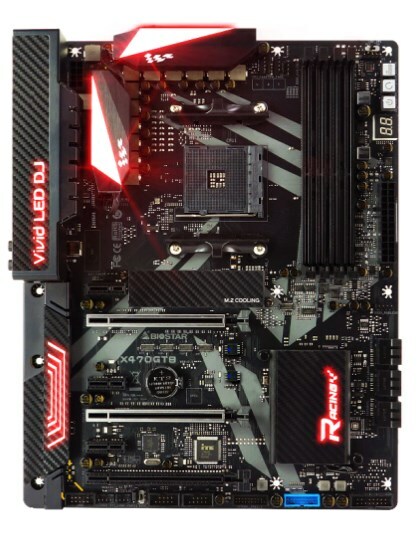 The BIOSTAR RACING X470GT8 motherboard is the flagship model for the 2nd generation Ryzen processors featuring the new AMD X470 enthusiast chipset. It features an ATX form factor with three PCI-E 3.0 x16 slots and supports two dual-channel memory up to DDR4-3200MHz (OC). The RACING X470GT8 has a 12-digital power phase design to harness the power of the new Ryzen 7 2700X 8-core, 16-thread processor. The motherboard also packs 6x SATA III ports, 1x M.2 32Gb/s port with the BIOSTAR M.2 Cooling heatsink and integrated USB 3.1 Gen 2 (Type A and C). The Iron Slot Protection reinforces PCI-E x16 slots to protect heavier graphics cards from bending, and extend the longevity of the slots. IR digital power to provide the highest performance and superior stability. Supporting QC2.0 to help the battery of smart devices, including smart phone, tablet, and BT speaker, with faster charging time. With onboard LED for DIY fun and protects I/O interfaces and audio electronic components without the damage of static electricity. Packed with 2x 5050 LED headers to bring more colorful lighting options. M.2 Protection for the chip area and M.2 with stable operation and long lifespan. BIOSTAR’s exclusive set of features for the new RACING Series motherboards for performance and aesthetics that’s user-friendly and easy to customize. The new BIOSTAR Racing Face Design featuring improved aesthetics and features including VIVID LED Armor, Carbon Fiber-like Heatsink, and Fashion Matte Black PCB. The Super Face Design concept offer enthusiasts and gamers a visually appealing motherboard complete with customizable RGB lighting options. BIOSTAR Powerful Hardware design that ensures durability and stability including features such as Super Durable Solid Caps, Dual BIOS, Digital Power+, PCI-E M.2 32Gb/s, and Lightning Charger. BIOSTAR Hi-Fi Design delivers high-fidelity audio for immersive gaming audio. Features such as ALC1220 120dB, Smart Ear, Hi-Fi Ground Design, Hi-Fi Cap, and ESD 15000V Proof deliver clear and quality audio. BIOSTAR Racing Series features a user-friendly UI design for easy navigation and tuning. Information about the system can be viewed at a glance and all the BIOSTAR exclusive features such as Smart Ear, Advanced VIVID LED DJ, and others can be accessed easily for fine-tuning and customization. BIOSTAR’s interesting DIY Design features a wide selection of customization and personalization options such as VIVID LED DJ Utility and 5050 LED Fun Zone. The Advanced VIVID LED DJ Utility gives full control and customization on RGB lighting which connected through the 5050 LED Fun Zone headers. BIOSTAR RACING X470GT8 rear I/O ports have the legacy PS/2 connector support 1 x PS/2 for keyboard, 2 x USB 3.1Gen2 ports: 1 for Type A and 1 for Type C, 4 x USB 3.1Gen1 ports, DVI-D, HDMI 1.4, Display Port, GbE LAN Port and 6 x Audio Connectors. The BIOSTAR RACING X470 motherboards offer performance and design to harness the powerful second-generation AMD Ryzen processors. The BIOSTAR RACING X470GT8 is perfect for enthusiasts looking into building an unrestricted high-performance gaming setup with multiple graphics cards and high-speed PCI-E solid-state drives.